As I was participating in tonight’s Holy Thursday mass, I remembered that Thomas Aquinas wrote one of the great hymns that we sing today – Pange Lingua. This patron saint of ours was a very intimidating person, in more ways than one, wasn’t he? that bread may be hungry, and the fountain thirsty; that the light might sleep, and the way be weary from a journey; that the truth might be accused by false witnesses, and the judge of the living and the dead be judged by a mortal judge; that justice might be convicted by the unjust, and discipline be scourged with whips hung up on a tree; that strength might grow weak, eternal health be wounded, life die. I can think of three possible reasons why “we” don’t do this, two of which are ivory-tower related and maybe factor in more than they should. I’m sure there are more reasons. 1) Tenure requirements and, let’s face it, the sensibility that some theologies are more worthy than others. 2) Most of us aren’t priests anymore. We’re lay people with families. We don’t spend as much time as we ought, or want, to spend praying. 3) Humility (false or otherwise). Augustine and Thomas and Teresa of Avila really are hard acts to follow. That said, I probably ought to get off the computer (another ivory tower tool?). Blessed Triduum, everyone. See you after Easter. NextMission Creep in Libya: CIA Ops and Drones Now, Ground Troops and Assassination Attempts Later? 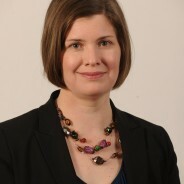 Jana Bennett is Associate Professor of Theological Ethics at the University of Dayton. Like everyone else contributing to this blog, she is concerned about the polarities she sees in contemporary Catholicism among academics and lay people alike. Jana Bennett has a BA from The Colorado College, an MDiv from Garrett-Evangelical Seminary and a PhD from Duke University. Her interests include Augustine, singleness, disability, and technology use. She came into full communion with the Roman Catholic Church in 2003, after having grown up United Methodist. She is married with two kids. “Setting the Captives Free”: Is There Precedent for Embryo Adoption in Scripture and Medieval Christian Tradition? What a beautiful post. I too was moved by the words of Thomas last night whose devotion to the Eucharist was so great that we still sing his Tantum Ergo at adoration and benediction. I am always most moved by the lines “praestet fides supplementum sensuum defectui” (Faith will tell us Christ is present when our senses fail). Yet last night, it was the earlier line that grabbed me and which I recall as I read your post: et antiquum documentum novo cedat ritui (Over ancient forms of worship, newer rites of grace prevail). I thought of our parish priest bending down to wash 12 of our parishioners’ feet, including the feet of a teenager, a very elderly woman, and several married couples. I thought of the two readers for the mass, both of whom were women, and the two extraordinary ministers, also women. And I also thought of me, a young married woman, studying and teaching theology, celebrating the Holy Thursday mass and adoration with my Protestant minister husband. Novo ritui indeed! We may not write mystery novels, but we teach theology to college students, most of whom, until recently, would never have an opportunity to study the works of Augustine or Aquinas. We may not write great hymns, but we sing silly songs of faith to our children (“The Fruit of the Spirit’s Not a Banana” anyone?). We may not worship as much as we would like, but we lead service trips, mentor students, care for sick children, and love our spouses. So much of the life of a married theologian teacher is antithetical to the ivory tower, and it is important to recognize the many ways in which theologians today are contributing to the life of the church in new, often unacknowledged ways. Most of us won’t go down in history for what we do, but I guess that is not the point. I like to remember that Thomas, right before he died, said all of his work which we are so awed by today was “like so much straw” compared to what he had seen.